Right next to my favorite New Orleans restaurant, Jacques’Imo’s, which reopened after Katrina on December 29, is the Maple Leaf, where the Rebirth Brass Band has held court on Tuesday nights for years. I’m happy to report they are back at the Maple Leaf Tuesdays starting in January ’06. Have to have Jelly Roll on any New Orleans album – he carried around a business card – “Jelly Roll Morton – Inventor of Jazz.” These recordings were made by Alan Lomax at the Library of Congress in 1938. Lomax found Jelly Roll down and out, playing in DC in a down and out gin joint, asked him to come to the grand piano in the Coolidge Auditorium at the LOC and lay out the whole story of jazz from top to bottom. All of these recordings have recently been re-released by Rounder Records. 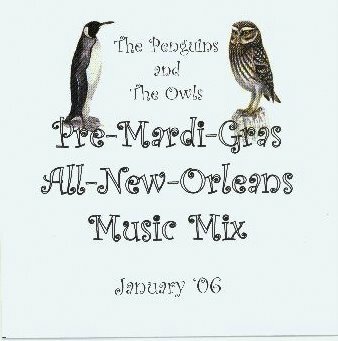 The song for which the New Orleans club gets its name. I saw a show here on Christmas Day 2005. This is a phenomenal howling solo performance by Professor Longhair (1918-1980), in London. This is from a fantastic Katrina benefit album from Nonesuch Records – Our New Orleans 2005 – The quality of music from Nonesuch is always nonpareil – they haven’t disappointed here with all songs recorded after August 29, 2005 by New Orleans artists. I heartily recommend getting this album – proceeds will be donated to Habitat for Humanity. Another excellent Katrina benefit album from New Orleans piano genius Dr. John, where he takes the classic spiritual Wade in the Water to new places. From Dr. John and the lower 911 – Sippiana Hurricane. This was recorded at the historic Bearsville studio in Woodstock New York. This Katrina benefit CD is from Rounder Records and Marsalis Music – all proceeds will be donated to MusiCares Hurricane Relief 2005. There is excellent material on here – if you like this, I recommend picking up the whole album. Some poetry to set up the vision of New Orleans at Mardi Gras time. A ritual song sung by the Mardi Gras Indians. This song is sung at the passing of an Indian, one of the men in the social clubs that march in fully festooned regalia at Mardi Gras time. This song is also sung at the beginning of many Indian rehearsals, which happen Sunday nights throughout the year. This is an R&B version of a Mardi Indian song – Iko, Iko – which is usually performed with voices, tambourine and whatever beat-making percussion is near at hand. Tremendous fiddling from the veteran Cajun band BeauSoleil. Dewey Balfa and the Balfa Brothers give us a little bit of Cajun Mardi Gras sounds like. Klezmer zydeco – who’d’ve thunk it – the minor key masters do their take on the romping style of this Boozoo Chavis tune. One of my favorite New Orleans performers – saw him at Tipitina’s on Christmas – I’ve seen him play live twice, and both times, I have been riveted the whole time, watching his every move. This guy has immense piano chops, a beautiful voice and a gripping performance style. I’ve heard about Fats Domino’s legendary barrelhouse piano performances, where he would play the piano so hard it would slide around the stage. This is a cleaned up poppy number that gives a hint of that rocking live performance style. Christmas night this year, I went to see Marva Wright’s Christmas Revue – she does it every year at Tipitina’s – she ripped the roof of the place with this version of “I Will Survive”- with the post-Katrina resonance, the song really hit home – making you want to laugh and cry at the same time. This recording doesn’t quite do it justice, but it gives an idea of what Marva is capable of. What more can you say than Pops. It seems he had the biggest heart in music ever. When Alan Lomax was asked to program the music for the disk that went on the Voyager space probe that would represent life on earth, he made sure there was a Louis Armstrong cut on there.